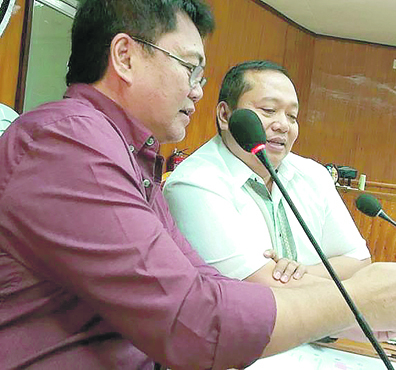 Tacloban City—“Proyekto 25,” a banner project of Eastern Samar Acting Governor Marcelo “Dindo” Picardal, has yielded reforms to the hospital operations in the province. Eastern Samar Acting Governor Marcelo ‘Dindo’ Picardal (right) discusses with Provincial Administrator George Erroba the province’s ‘Proyekto 25’ that focuses on the development of agri-fishery, health, tourism, and good governance, for Eastern Samar to lessen its poverty incidence from 46.3 percent to 25 percent for the next five to eight years. “Governor Picardal doesn’t like that people have to line up and wait for a long time, so we have put up a mechanism to speed up the transactions,” said Provincial Administrator George Erroba on Thursday. To fix the bureaucracy, Picardal put up a Provincial Governor’s Office in the hospitals to “immediately respond to the problems and monitor the needs of the patients” who are confined there. “Picardal did this to deliver better service to the constituents. This is one of the goals of ‘Proyekto 25,’ to provide transparency and good governance in Picardal’s administration,” said Erroba. He said Picardal is “keen on implementing inclusive solution through ‘Proyekto 25’ for the province to move out from the list of poorest provinces” in the Philippines. “With the availability of the medicines and supplies, more people opted to go to government hospitals because of the availability of logistics,” he said. PhilHealth officials around the country already visited the province and recognized the mechanism established by Picardal in all government hospitals in Eastern Samar. As of November 2018, about 18,230 in-patients (admissions) were accommodated in all of its hospitals, with 44 percent or 8,194 admitted in Eastern Samar Provincial Hospital. On the average, the monthly bed occupancy rate is 80 percent, a PhilHealth report said. Five out of nine hospitals had more than 85 percent monthly bed occupancy rate, the report added. Erroba maintained that Picardal’s administration brought “a significant overall increase of 32 percent in bed occupancy rate in most hospitals” in Eastern Samar. The “Proyekto 25” is part of Picardal’s medium-term plan which aims to lower the poverty incidence of 46.3 percent in the province into 25 percent by focusing on the development of health, good governance, tourism, and agri-fishery. “’Proyekto 25’ is a social preparation. It can be accomplished from five to eight years,” said Erroba. In 2017, the provincial average of monthly bed occupancy rate is 48 percent, and this was increased to 80 percent in 2018, it added. As of this year, Philhealth benefit payments is 98 percent of all hospital collections. According to Erroba, the province has already exceeded the target collection of P100 million in 2018. As of December 2018, the total amount of hospital collection is P164,007,151. 22. For 2019, 10 out of 12 hospitals have Department of Health (DOH) license to operate and accredited with the Philippine Health Insurance (Philhealth). These are the Arteche District Hospital (Infirmary), Oras District Hospital (Infirmary, Animal Bite Treatment Center or ABTC), Can-avid Municipal Hospital (Infirmary), Taft District Hospital (Infirmary, ABTC), Eastern Samar Provincial Hospital (Level II, ABTC), Llorente Municipal Hospital (Infirmary), Gen. Mac Arthur Municipal Hospital (Infirmary), Quinapondan Community Hospital (Infirmary), Albino Duran Memorial Hospital (Infirmary, ABTC, Tuberculosis-Directly Observed Treatment Short-course or TB-DOTS), and Felipe Abrigo Memorial Hospital (Level I, ABTC). Homonhon Island Community Hospital and Dolores Municipal Hospital remain unlicensed and unaccredited pending rehabilitation of their buildings, according to the report. DMH is declared unsafe for occupancy, while HICH is having on-going rehabilitation, the report said.